Jiangsu Dagua Water Services Inc.
No alteration in the pH of treated water, so no remunerization required. Unlike many other treatment technologies, the DaguaFlo solution requires no costly chemical products, specialized labour or replacement parts. With power supply representing the main operating cost, these benefits represent a significant overall economic value for our clients. When capital costs and annual recurring operating costs are combined over a 20-year period, Dagua comes out well ahead of the competition. Who can do better? 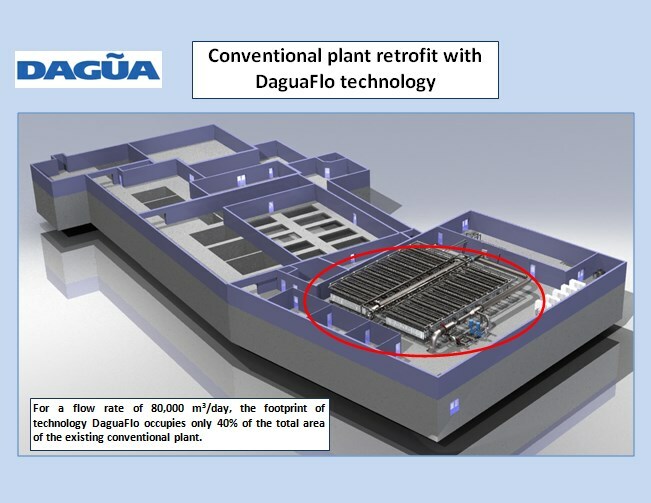 Dagua offers a unique value proposition for local and international communities with large-scale drinking water treatment projects (flow rates of 5,000 to 500,000 m3/day). Unlike most treatment alternatives, the DaguaFlo process treats raw water without the use of chemicals (coagulants or flocculants), even when contaminated content is exceptionally high. Scientifically proven and government certified, the DaguaFlo solution has the demonstrated advantage of requiring only water and air for the operation and regular maintenance of its plants. As such, the process generates neither sludge nor toxic waste, which are costly and difficult to manage. The DaguaFlo solution not only streamlines plant operations by eliminating the need for chemical products and sludge management, but continuously monitors drinking water quality and plant operations as well. Regardless of variations in the quality of your raw water, you can always count on a reliable supply of high-quality drinking water, with only 60 minutes of operator attention per day. For additional ease of operation, a telemetric link (modem or Internet) enables you to monitor and manage plant operations from a remote location. As well, the plant makes process adjustments in response to fluctuations in raw water quality and performs regular system cleanings automatically. Delivering highly effective water purification and disinfection, Dagua’s ozone-membrane process occupies up to 40% less space than conventional coagulation processes. This smaller footprint translates into major savings on infrastructure costs. Dagua’s rate structure offers a considerable overall financial advantage when capital costs are combined with operating costs over a 25-year period. In the municipal sector, where operating costs are financed through tax revenues, it is especially important to consider all costs involved when choosing a water treatment technology. The DaguaFlo system requires no costly chemicals, labour or replacement parts. As such, power represents the main operating cost. These advantages translate into substantial savings on operations, delivering real economic value for our clients. Do you need a water treatment system that can supply a community of up to 13,000 people (or up to 500,000 in certain international markets) Whether you are dealing with surface water or highly contaminated groundwater, the DaguaFlo solution is for you. Our easy-to-operate and chemical-free turnkey system is perfectly suited to the specific requirements of the municipal sector, recreational sectors (hotels, campgrounds, tourist sites) and industrial sectors (mining, forestry camps, hydro electric generating stations). With its prefabricated modular design, the plant can be deployed alone or in multiple units, depending on your drinking water requirements. It can be delivered with its own housing or incorporated into an existing structure. Our plants can even be mounted on wheels for mobile units. Each plant is designed to respond to the specific needs and realities of our clients. 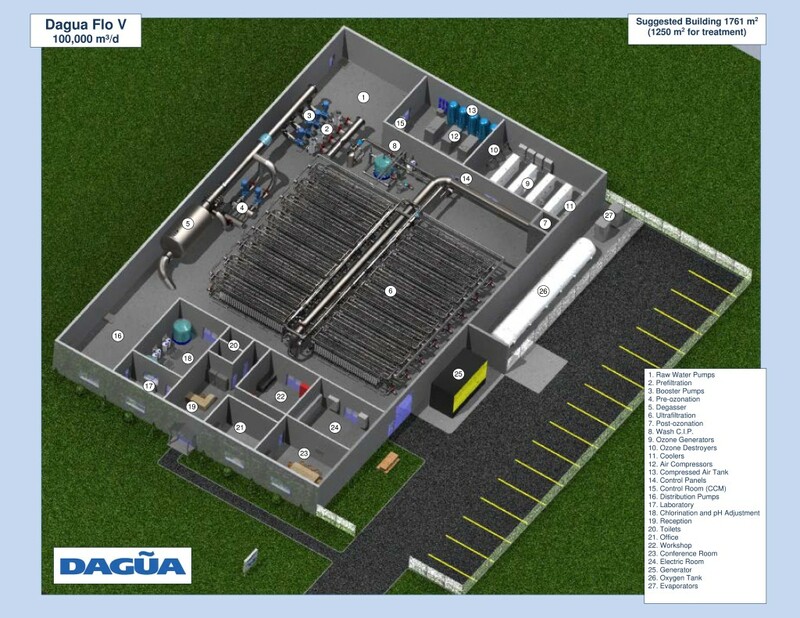 In response to increasingly stringent municipal wastewater standards, Dagua is also able to supply and install its high performance ozone generators for the safe and effective treatment of municipal effluent. Our products ensure years of efficient, safe and reliable operation.